You can see the actual percentages for Census years 2011 and 2016 on our main Census Postcode page. This post shows how the Baby Boomer population is rapidly changing in the face of overall massive increases in the entire population. 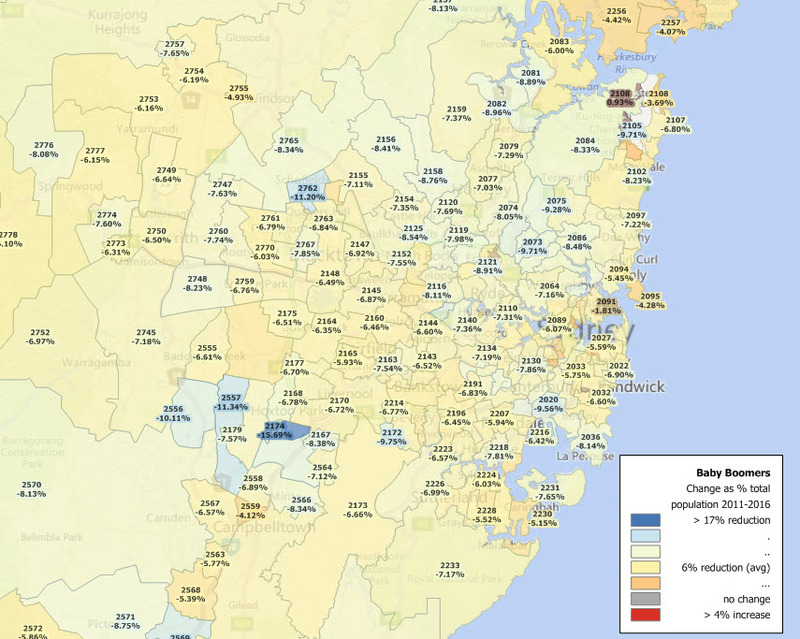 In NSW and the ACT, very few postcode areas show any increase in Boomer numbers when expressed as a percentage of overall population. The red areas in the ACT most likely the result of newly opened retirement village developments. The same applies for the area around Iluka on the north coast. 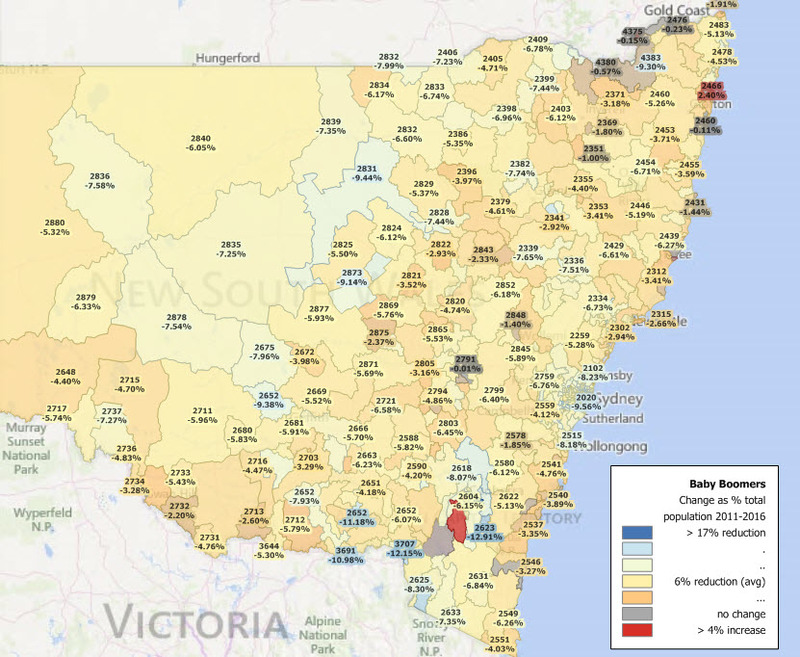 For the Sydney area, Boomers have been either dying off very rapidly – smoking was very common when they were younger – or are simply being swamped by the huge growth in immigration rates. For the area shown below, the total population has increased by 17.6% since the 2006 Census. Breaking that down further, population in the area shown increased 6.7% between 2006 and 2011, and almost doubled again between 2011 and 2016 by a further 414,515 people. That translates to an additional 227 people per day, over and above those lost to mortality. All need a place to live, with an average number of persons per dwelling of 3 (Census 2016 postcode data) in this area, that means an additional 75 homes must be completed for new occupation every single day. More resources consumed, more waste generated. Surely this cannot be sustained, but with most politicians meekly adhering to “growth” as a substitute for reason, Australia’s once livable major centres seem destined to slavishly follow so much of the rest of the world into overcrowding and all that accompanies it. 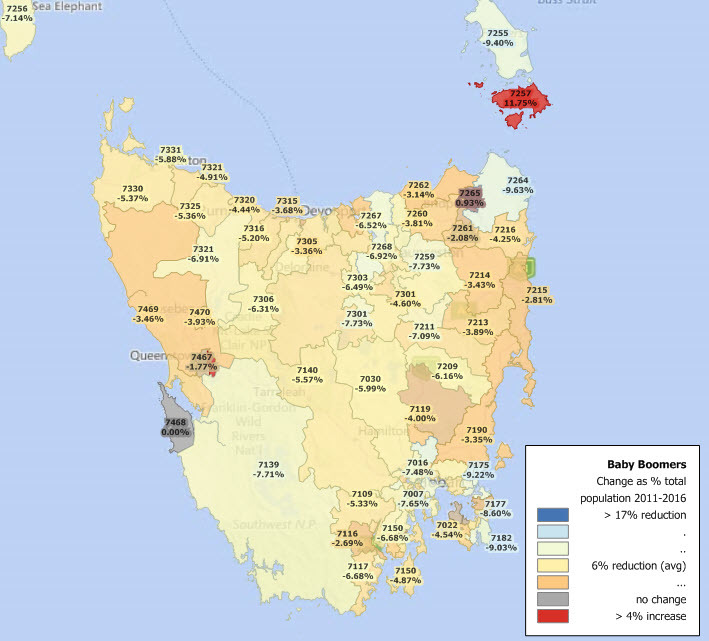 Tasmania hasn’t seen the same unsustainable rate of immigration and so this picture shows a more reasonable “background” Boomer percent pattern, still declining as we’d expect of any ageing cohort, but at significantly lower rates owing to relatively subdued rate of migrant resettlement there. See the picture for the place you call home – buy a Mapmakers 2017 Census enhanced data product!